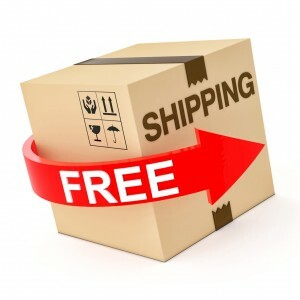 Home » Blog » How Can Offering Free Shipping Drive Sales? Even though it’s such a common offer, companies still need to take a few things into consideration before implementing free shipping, like how to offer free shipping and still make money, does free shipping increase sales, when to offer free shipping, and most of all, the cost of free shipping. If you want to find out more about free shipping for small businesses, just keep on reading—we’ve got all the information you need to know about the impact of free shipping on sales and the benefits of free shipping. What Does Free Shipping Mean for Retailers? So, you know that many of your competitors offer free shipping. But what does this mean for you? Simply put, it means that if you don’t offer free shipping, you’ll be falling behind your competition. This can be intimidating for smaller businesses since “free shipping” doesn’t mean free for everyone. After all, carriers won’t ship items free of charge just because a retailer asks them to—someone has to foot the bill, whether it’s the retailer or customer. Online retailers can reap a ton of perks from free shipping like conversion rates and more items per sale. While it can be more of a stretch for smaller businesses, there are strategies that they can use to help cover the costs that free shipping will incur. It’s obvious that offering free shipping is important when it comes to running a successful e-commerce business, but you’ll need to asses when it’ll be feasible for you to do so. A good rule of thumb is to set a minimum order amount, so you can avoid losing money on small transactions and ensure your costs will always be adequately covered. In addition, you can use this tactic to encourage larger orders. Customers are more likely to add a few extra items to their cart to bump up their total just past the threshold to take advantage of your free shipping. In this case, free shipping can increase your sales. If you’d rather not set a pre-determined shipping minimum, a different route would be to offer free shipping on certain items. Strategically selecting the items you can ship for free will help you cut down costs. For example, you’d be able to save money by offering free shipping on an expensive, lightweight item like a ring or bracelet versus shipping a low-cost, heavier-weighted item like a bottle of lotion for free. If none of these options are feasible for your business, consider flat-rate shipping; it’s the second-best option after free shipping in the eyes of your customers. Flat-rate shipping is transparent and easy to understand, since customers know they won’t be surprised by excessive charges once they begin to check out a large order. Research has shown that as many as 67% of online retailers have offered some type of free shipping since 2013. Even if there are stipulations surrounding the offer, more than 75% of customers say that it’s important to them that it’s an option, and it’s a deciding factor when proceeding to checkout. Naturally, since free shipping has become such as widespread expectation, the demand for free return shipping is becoming more prevalent as well. In fact, 67% of customers have said that they carefully review a company’s return policy before making a purchase from their site, and that free returns were the most important factor that played into their decision. Free return shipping also plays a big part in ensuring the return process is a positive one for your customer, making it a great tool to help encourage more sales. In short, free shipping (both initial and return) is extremely important to online shoppers. There are a ton of ways that free shipping can help to drive your online sales. From increasing customers’ item count per sale to decreasing abandoned shopping carts, free shipping can work wonders when it comes to getting more customers past the checkout page. It can even help you get rid of inventory that’s going out of season or that you need to clear out. Strategically scheduling when and how you offer free shipping can actually be advantageous. Free shipping is such a sought-after bargain that you can encourage customers to spend more, buy certain items, make their purchase during a certain time, and even join your e-mail list, which increases their chances of making a repeat purchase. Overall, free shipping can help you drive sales and increase revenue in a number of different ways. Free shipping is a great marketing tactic you can tailor and use to your advantage. However, since so many e-commerce businesses have caught on, it’s now become expected. It’s almost essential if you want to stay competitive with other similar online retailers. There are a number of attainable options even for small businesses when it comes to affordable or free shipping; you just have to find the right one for you. If you want to work towards cheap or free shipping options for your customers, choose APS Fulfillment, Inc. to handle your fulfillment services. Our services are designed to make order fulfillment effortless for small and medium-sized businesses. In addition to international fulfillment shipping, we also handle product return processing so your customers can enjoy a hassle-free process every time. Contact APS Fulfillment today to optimize all of your shipping and warehousing services.